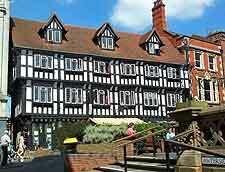 Lincoln is a city proud of its rich history, Tudor architecture and modern-day tourism. City life is based in the very heart of Lincoln, around the High Street, in the region of the Brayford Waterfront and within the vibrant Cathedral Quarter. 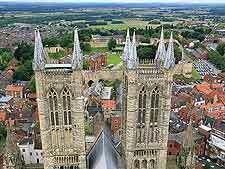 Many tourists visiting this part of England choose instead to head to York, which is further north and famous for its cathedral. However, few know that the Lincoln Cathedral is arguably equally impressive, dating back to the 12th century and remaining England's third-biggest place of worship. Close by and opposite the Exchequer Gate is the office of Castle Square Tourist Information, where evening ghost walks regularly depart. A little to the south and near to Lincoln's Waterside Shopping Centre is the Cornhill Tourist Information office. 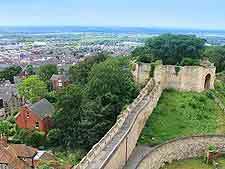 The tourist attractions of Lincoln are often a little historical in character, with remains of Roman walls and wonderful black and white medieval timber-framed buildings, a number of which line Steep Hill. Guided walking tours of central Lincoln are a good way to begin any holiday here, as are boat trips along the River Witham and the connecting Fossdyke canal. Many visitors also enjoy paying a visit to the lush hothouse known as the Sir Joseph Banks Conservatory, which is part of the 'Lawn' complex of Union Road, while for families, a trip to the Hartsholme Country Park, the neighbouring Rand Farm Park or Woodside Wildlife and Falconry make for a popular excursion. Others may simply be here for the day, to check out a football game, since Lincoln City regularly plays at the Sincil Bank Stadium. More information about Lincoln Tourist Attractions. Although the city's cathedral really does dominate the city in so many ways, there are many further landmarks of great importance. One of these is of course Lincoln Castle, a magnificent fortress built towards the end of the 11th century. 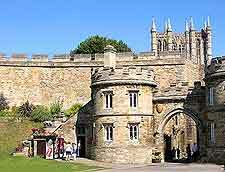 Over the centuries, Lincoln Castle has operated as a prison and dungeons, a setting for public executions, and today as the site of a working Crown Court. Just a stone's throw away are the remains of the once splendid Medieval Bishop's Palace, which is now sadly in a state of ruins. Slightly to the north and just past the Bailgate shopping area is the Newport Arch, which leads onto Church Lane and is more than 1,600 years old, being built by the Romans. To the south and close to Lincoln's Guildhall is the rather unconventional High Bridge, a single-arch stone bridge now home to a popular teashop. More information about Lincoln Landmarks and Monuments. 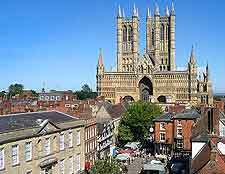 Lincolnshire contains many good museums, several of which are based in Lincoln itself, or very close by. Amongst the best is the Museum of Lincolnshire Life, where information and exhibits concentrate on the county's achievements, history and past. Completely different is the Battle of Britain Memorial Flight Visitor Centre at RAF Coningsby, where you can get close-up to old WWII aircraft and bombers, such as the Lancaster and Spitfire. Quality art galleries also attract tourists, with the Usher Gallery and the considerably newer venue named 'The Collection' being situated side-by-side and contain both Old Masters, by artists such as Lowry and Turner, and more modern, contemporary canvasses. More information about Lincoln Museums and Lincoln Art Galleries. 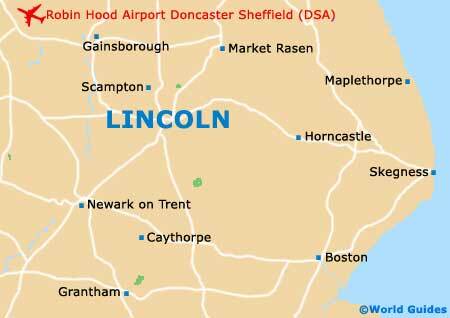 In every direction there are day trips tempting holiday makers based in Lincoln. The Lincolnshire coastline is especially enticing and is home to the popular seaside resorts of Cleethorpes, Ingoldmells, Mablethorpe, Skegness and Sutton on Sea. Also nearby are the lively towns of Boston, Grantham, Louth, Newark, Peterborough, Rotherham, Spalding, Stamford and Wainfleet, where regular local markets are held. Tourists prepared to travel a little further may like to consider a day trip to Nottingham, which is known for its legendary connections with the fictional Robin Hood and his 'Lincoln Green' woollen cloth, which allowed him and his outlaws to remain disguised in Sherwood Forest. The cities of Derby, Hull, Leicester and Sheffield are also within reach. More information about Lincoln Attractions Nearby.